Last week I wrote about the interesting hunting habits of our local Harris’s Hawks. Today I will cover another one of Mexico’s Baja Peninsulas characters, the Zone-tailed Hawk Buteo Albonotatus. Very similar in size and shape to the very common Turkey Vulture, the Zone-tailed Hawk is quite often found circling on the wind currents with those very vultures. Given the scavenger feeding habits of the Turkey Vultures, the small mammals and birds that are on the menu for the Zone-tailed hawks are lulled into complacency by the lack of threat from the vultures. 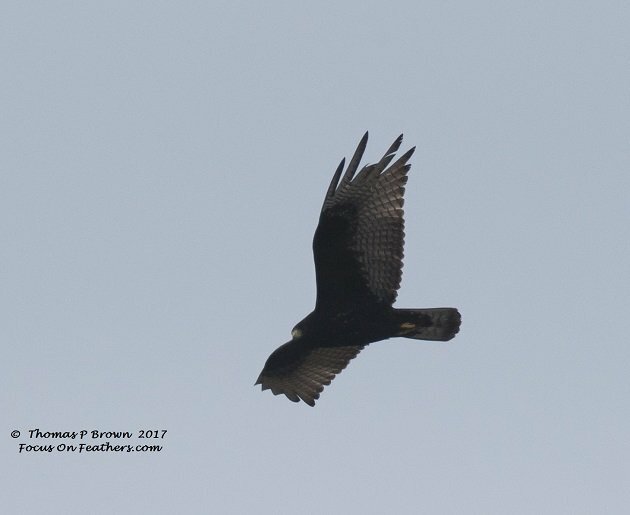 This allows the Zone-tailed Hawk to approach much closer, before swooping in quickly. I have to admit, that I too have been lulled by the very same vultures, as on any given day here in La Paz, I can see 50 or more Turkey Vultures soaring over head. Taking time to give each and every one a good looking over can take away from the time I spend looking for Lazuli Buntings, Black-bellied Whistling Ducks, or other more exciting birds. For me, the key to identifying the difference, comes with the banding on the tail, and when a bit closer, the yellow legs and cere. The tail bands on the adult birds consist of three bands with the third, or lower band much wider and cleaner white. In juvenile birds, the tail bands are made up of 8-10 finer bands, and will give more of a silver/gray appearance at any amount of distance. 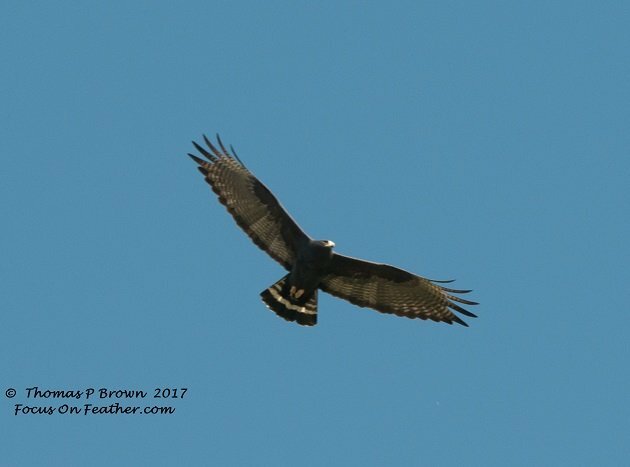 The mature Zone-tailed Hawk is also just a few inches smaller than the Turkey Vulture over all, and I find that the Turkey Vultures naked reddish head tends to protrude a bit more. 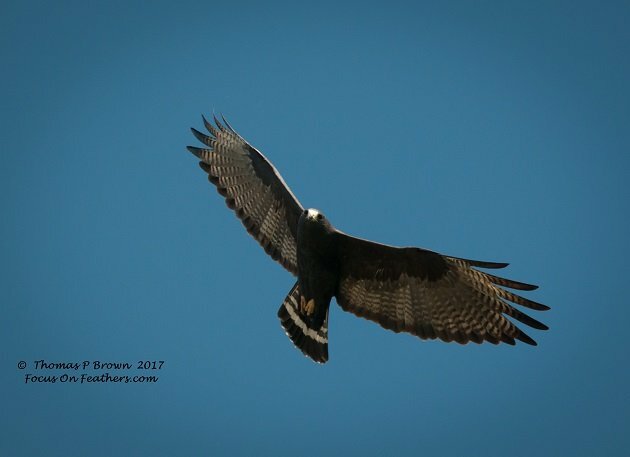 Zone-tailed Hawks can be found in the extreme lower parts of the US, in Arizona, New Mexico, and Texas, with an estimated population of 450-650 birds. Mexico’s Baja Peninsula has a strong resident population, and they can be found sporadically thru out main land Mexico. Their territory also includes portions of Central America, down into eastern Columbia, Ecuador and Peru. There is a small population in Brazil, Paraguay, Bolivia, and northern Argentina. While there is a small fraction of these birds that are migratory, mostly the Central American birds, many remain as year round residents. The US population migrate down to Oaxaca, Mexico and parts of the Yucatan area for the winter. Below is a photo I got on Sunday of a juvenile. it was a glooming, gray day, so the photo isn’t the best, but it was better than nothing..
Nice post about that cool hawk. I see them from time to time in Costa Rica and enjoy every sighting. Where Are You Birding This Third Weekend of February 2016?